Perhaps I've gone too far. I'm in an underground cavern beneath Peru. It seems to be a complex maze, perhaps eight chambers wide and over three times as deep. Niece Rhonda has disappeared, along with Quickclaw, our cowardly cat. I am beset by all manner of subterranean creatures in this vast, ancient labrynth. And all because of a rock--the Raj diamond. It was stolen a century ago, and hidden here. 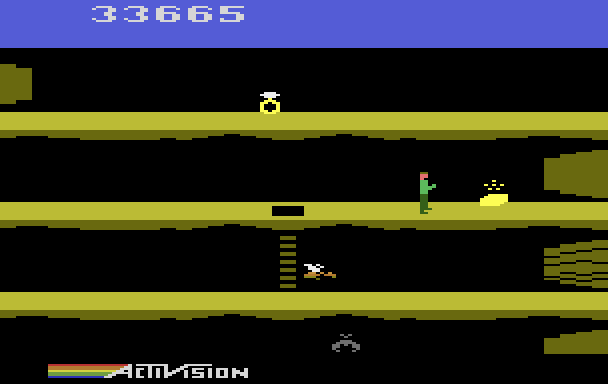 Without a doubt, the greatest game ever made for the Atari 2600 was Pitfall II: Lost Caverns. 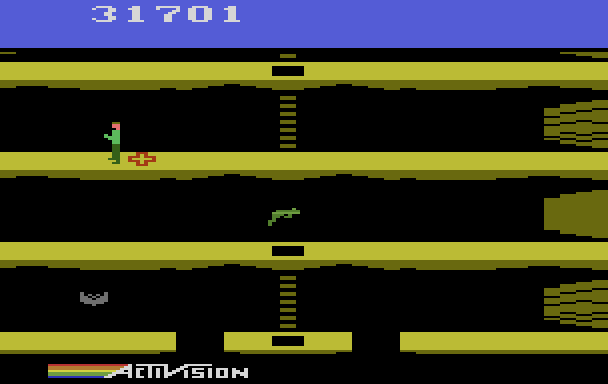 The original Pitfall! set the standard for Atari adventure games as it sent our intrepid hero, an Indiana Jones clone named Pitfall Harry, to a junge where he must avoid the likes of scorpions, crocodiles quicksand and tar pits (amongst other things). 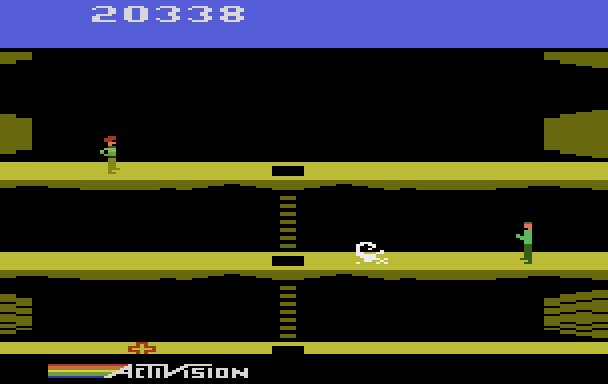 The goal of the first game was simply to collect 32 bars of gold in 20 minutes without dying 3 times, a typical Atari-era video game goal. The sequel improves upon nearly every aspect of the original game and far surpasses the competition. To start, the game actually has a legitimate goal, not some arbitrary point score. Your goal is to collect the Raj diamond, rescue your niece Rhonda and also your cowardly cat Quickclaw (with an added bonus for collecting a rare rat and the usual gold bars). What's more, you are given an infinite amount of lives and time with which to accomplish these goals (there are scattered checkpoints and when you die, you are transported back to the last one you reached, deducting points as you go). You're given a few new abilities (like the ability to swim) and you face a new series of hazards, including poisonous frogs, bats, condors and electric eels. 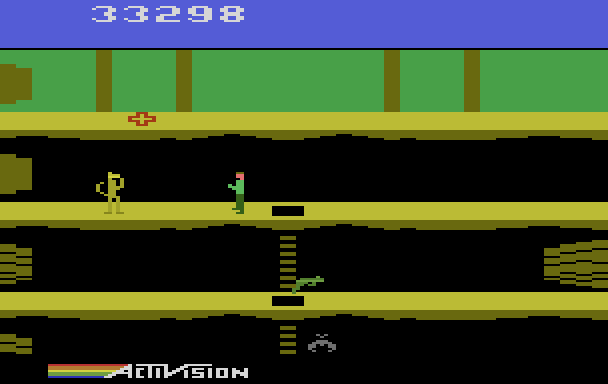 From a technological standpoint, Pitfall II pushed the envelope both visually and musically. 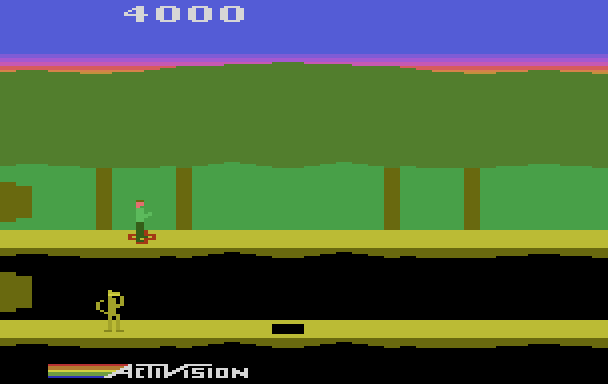 It was one of the largest games ever created for the 2600 (a whopping 10k), and it included features like smooth scrolling, an expansive map, relatively high-resolution graphics, varying scenery, detailed animations and a first-rate musical score that was detailed and varied (quite an accomplishment considering that most 2600 games did not feature music at all). Obviously, all of these things are trivial by current standards, but at the time, this was an astounding feat. Indeed, it was only made possible because of custom hardware built inside the game cartridge that enhanced the 2600's video and audio capabilities. You start the game in the jungle. In a perverse maneuver, the game's designers made sure that you could see Quickclaw (one of your primary objectives) immediately beneath your starting point, but to actually reach him you must traverse the entire map! 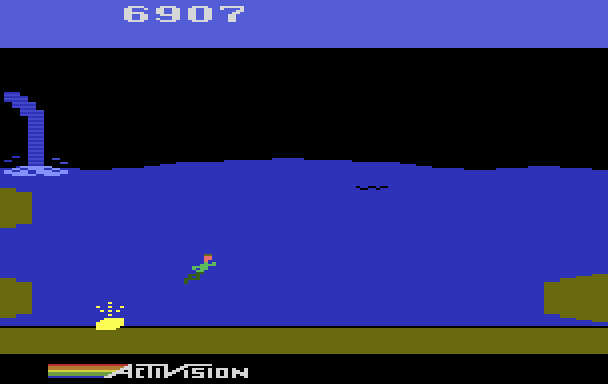 Again, the sequel imbues Pitfall Harry with a few extra abilities, including the ability to swim. Naturally, this benefit does not come without danger, as shown by the electric eel swimming along side our hero (you can't see it in the screenshot, but the eel alternates between a white squiggly line and a black squiggly line, thus conveying it's electric nature). Also of note is the rather nice graphical element of the waterfall. As you explore the caverns, you run across various checkpoints marked with a cross. When you touch a cross, it becomes your new starting point whenever you die. I think that green thing is supposed to be a poison frog. At various points in the game you are faced with a huge, vertical open space. Sometimes you just have to jump. One of the great things about this game, though, is that there is a surprising amount of freedom of movement. You could, if you wanted, just take the ladder down to the bottom of the cavern instead of jumping (though at one point, if you want to get the Raj ring, you'll need to face the abyss). Plus, there are all sorts of gold bars hidden around the caves in places that you don't have to go. Obviously, there are a limited number of specific paths you can take - it's no GTA III - but given the constraints at the time, this was a neat aspect of the game. 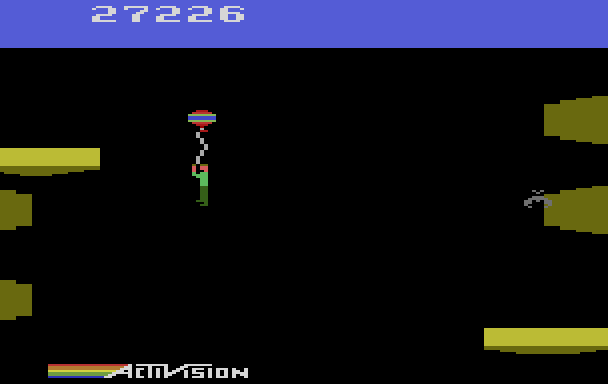 Another innovation in Pitfall II is Harry's ability to grab onto a rising balloon and ride it to the top of the cavern (a necessary step at one point), dodging bats along the way. A pretty unique and exciting sequence for its time. The valiant Pitfall Harry, about to rescue his neice Rhonda. The designers' cruel sense of placement strikes again. I can see the Raj diamond, but how do you get there? Luckily, the game's freedom of movement allows you to backtrack if you want (and when you want). The final portion of the map is still, to this day, challenging. Up until this point in the game, you've only had to dogde a bat here, a condor there. This section requires you to really get your timing and reflexes in order, as you must complete a long sequence of evasions before you get to the top. Nevertheless, success was imminent. Everything about this game, from the packaging and manual (which is actually an excellent document done in the style of Pitfall Harry's aformentioned diary) to the graphics and music to the innovative gameplay and freedom of movement, is exceptional. Without a doubt, my favorite game for the 2600. Stay tuned for the honorable mentions! 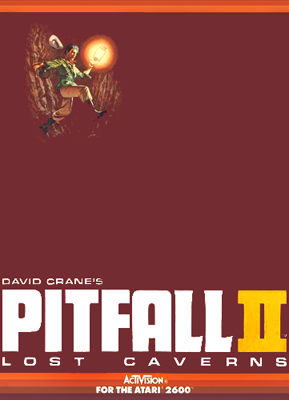 Wow, I never even knew there was a Pitfall sequel. I distinctly remember playing the original, along with games like Qbert, RiverRun and Air Sea Attack, though. I couldn't discern much of a point to the original game...was there any objective? 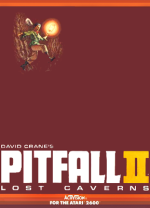 There are several sequels, but none compare, imo, to Pitfall II. There was a Super Pitfall for the NES (Not, amusingly enough, for the SNES), but it was terrible. There was the Mayan Adventure, which wasn't terrible, but not as good as the original games. Yeah, I think I got the Mayan Adventure free with my first computer, but I never got into that game. 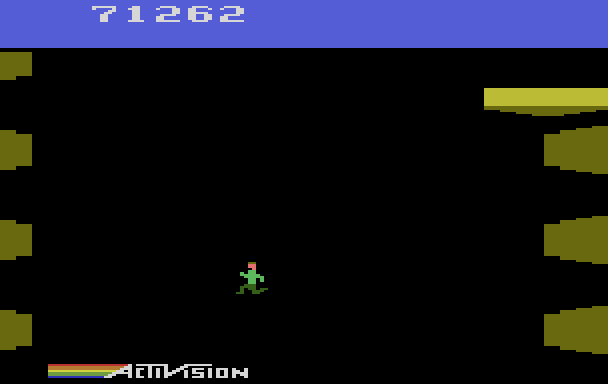 Pitfall II still rules!